American Book Collecting: Featured Item No. II: Randall's DUKEDOM LARGE ENOUGH. Inscribed to Frederick B. Adams, Jr. Featured Item No. II: Randall's DUKEDOM LARGE ENOUGH. Inscribed to Frederick B. Adams, Jr.
David A. Randall. DUKEDOM LARGE ENOUGH [REMINISCENCES OF A RARE BOOK DEALER, 1929-1956]. New York: Random House, . xiv 368  p. Plates. 8vo. Maroon cloth, spine stamped in gilt, dust jacket. 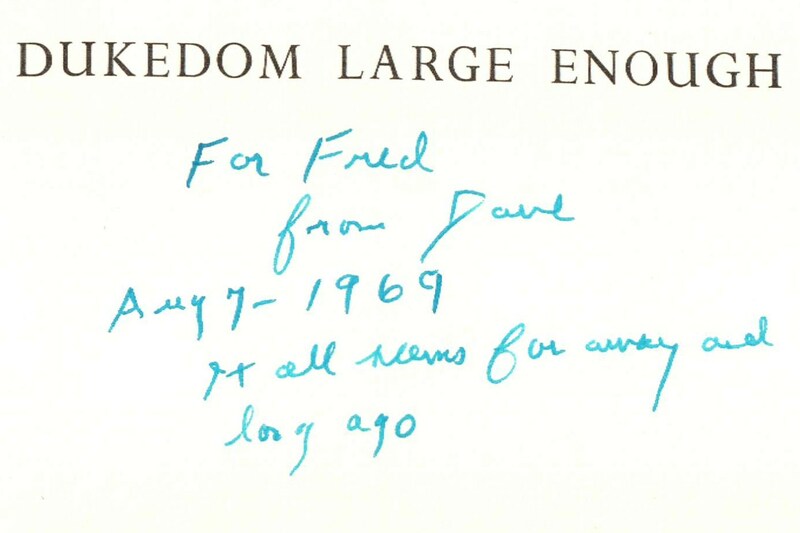 Inscribed to Frederick B. Adams, Jr., “For Fred from Dave, Aug. 7, 1969. It all seems far away and long ago.” Bookplate of Adams. Adams has marked various sections with annotated slips. Laid in is a copy of a TLs dated Jan. 24, 1973, from Randall to Reginald Allen at the Pierpont Morgan Library, discussing the acquisition of Gilbert & Sullivan material including reference to Carroll Wilson, and Randall’s thoughts on how a bibliography should be written. Also laid in is the AB tribute to Randall by Michael Papantonio. 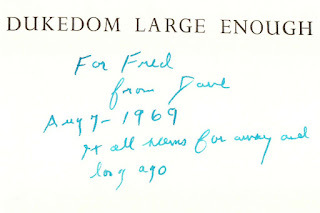 Adams delivered the main address at the gala dedication of the Lilly Library in 1960.